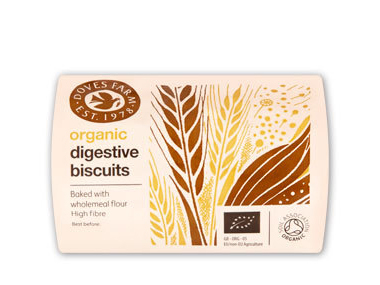 Buy Doves Farm Organic Digestive Biscuits in the UK from our online shop or directly from our independent Scottish store. Digestive biscuits baked with wholemeal flour, certified sustainable palm oil and a touch of malt for richness. Organic Digestive Biscuits baked with wholemeal flour, certified sustainable palm oil and a touch of malt for richness. Why not try them with cheese, as a base in a cheesecake or simply on their own? wholemeal wheat flour*67%(contains GLUTEN), palm oil*, sugar*, barley malt extract*(contains GLUTEN), raising agents(sodium bicarbonate, ammonium bicarbonate), salt. Baked in the UK. *Organic produce. Oatly cream has a thicker consistency than other dairy free creams which might make it more suitable for this recipe. I had a thorough look online, but couldn’t find any dairy free creams which specifically said suit-able for whipping. If you have had any experience of using dairy free whipped cream, please let us know! This recipe contains 400gr Doves Digestive Biscuits (vegan). You can use all sorts of berries for this recipe, like strawberries, red or black currants, brambles or blackberries, blueberies, honeyberries. You can also use frozen berries. This recipe contains 175 g digestive biscuits. As official Doves Farm stockist, we sell genuine Sweet Biscuits directly from our shop in Scotland and online throughout the UK. Where can you buy real Organic Digestive Biscuits safely online? If you are wondering where you can buy Doves Farm Organic Digestive Biscuits safely online in the UK, then shop with us. We are an actual health foods shop; with real people selling real foods and products. Our award-winning independent shop is located in Stirling, Scotland since 1976. You can buy our Organic flour and other genuine Sweet Biscuits in store or safely place an order with us online or over the phone. Organic Digestive Biscuits - Doves Farm Organic Digestive Biscuits in Sweet Biscuits and Biscuits & Breads.